Looking for a delicious gluten free mac and cheese recipe? You’ve got to try this one-pot meal in less than 20 minutes. This Gluten-Free Instant Pot Mac and Cheese recipe is so easy to make… and rich and creamy too. Oh macaroni and cheese… is there ever a reason NOT to indulge in this dinner classic? 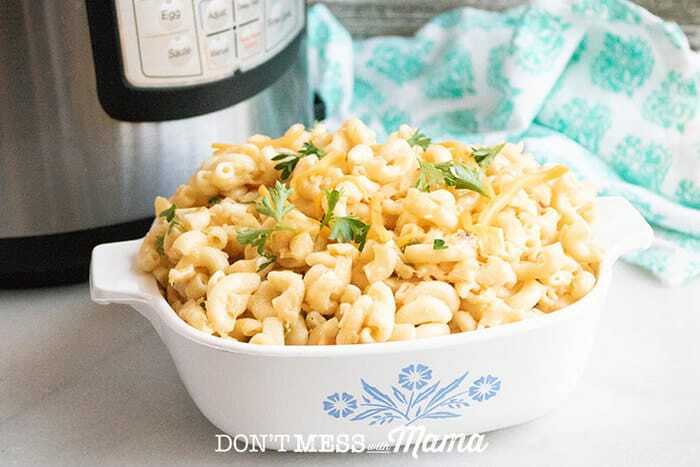 My kids want me to make this Gluten-Free Instant Pot Mac and Cheese at least once a week. It’s so creamy, delicious and frankly just so easy to make. I mean I can get dinner on the table in about 20 minutes and only use one pot to make it… that’s a win in my book. Ready for the Gluten-Free Instant Pot Mac and Cheese recipe? It’s so easy to make. You’ll be done from start to finish in about 20 minutes. 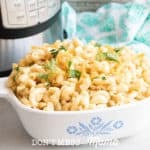 This Gluten-Free Instant Pot Mac and Cheese recipe uses gluten-free elbow macaroni but you can swap it out with wheat pasta if you like. The time to cook should be the same – I’ve had a friend test this with regular wheat elbow macaroni and she said it was all good. You can also swap out the cheese. This recipe calls for 1 cup of pepperjack cheese (to give it a little extra spice) but you can just replace it with sharp cheddar cheese… that means 3 cups of sharp cheddar cheese total. You can also replace the garnish with parmesan cheese and broil it in the oven (see the recipe for details) to get a crispy crust… my kids especially love this. Be sure to follow the directions, step by step… including the quick pressure release. If you allow it to do a natural release (about 5-7 minutes) it may overcook the pasta. This dish is a fantastic weekday meal that’s so satisfying for the whole family. And if you’re on the run a lot during the week with after-school activities or other commitments, you’ll love that this dish can be made in just about 20 minutes. Serve it up with this Gluten-Free Fried Fish, or for an easy weekday dinner some nitrate-free salami slices and fresh veggies and hummus. This dish is such a crowd-pleaser… so if you have friends or family coming over you can easily make a double batch. Looking for a delicious gluten-free mac and cheese recipe? You've got to try this one-pot meal in less than 20 minutes. This Gluten-Free Instant Pot Mac and Cheese recipe is so easy to make... and rich and creamy too. 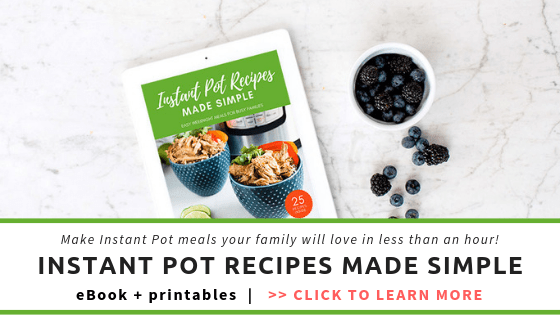 Combine first 7 ingredients in Instant Pot inner pot. Close the instant pot lid and turn pressure valve to seal. Cook on manual high pressure for 6 minutes. 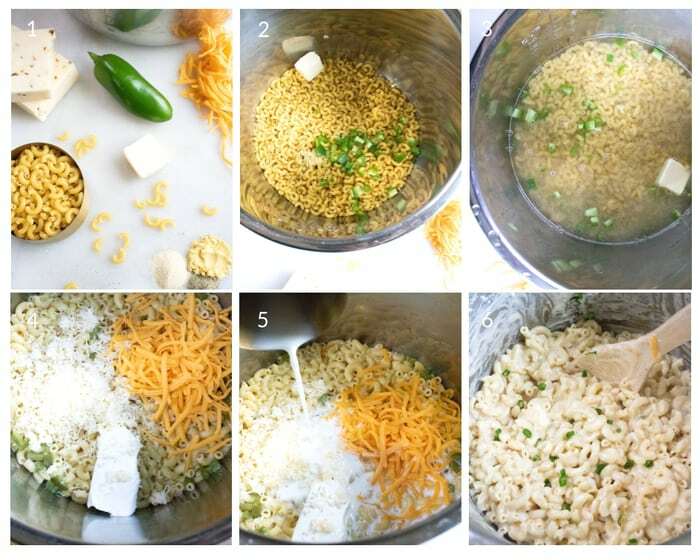 Allow for a quick pressure release and then add in the remaining ingredients, stirring in the cream cheese and cheese to melt with the pasta, and then adding in the milk a little at a time. Serve in a large bowl or platter and garnish with grated cheese and fresh parsley. Remember it takes about 10-12 minutes for the Instant Pot to reach pressure, so this entire dish takes about 20 minutes from start to finish. You can replace the pepperjack cheese with sharp cheddar cheese if you want to mild version of this recipe. As a garnish, you can replace the sharp cheddar cheese with grated parmesan cheese. For a crispy crust, put the mac and cheese in an oven-safe dish and turn the oven on broil. Replace the garnish with about 1/2 to 1 cup of parmesan and sprinkle on top of the mac and cheese. Broil for 2-3 minutes or until the top is crispy. 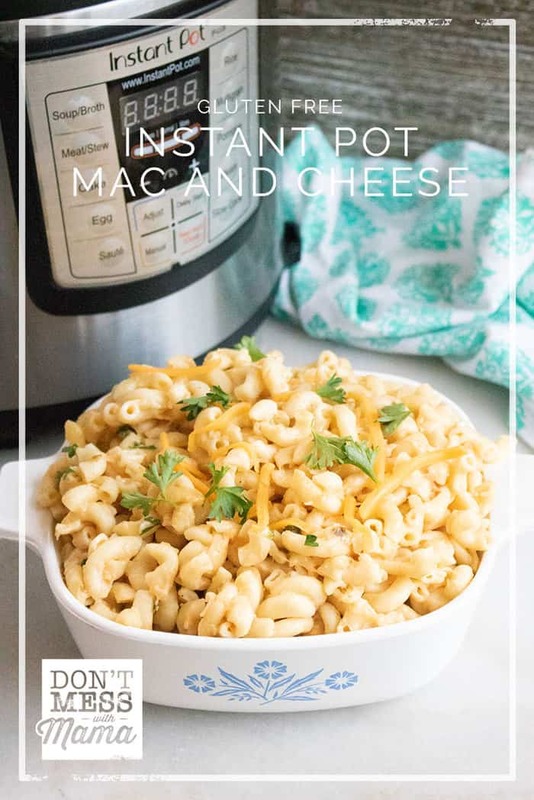 Did you try this Gluten-Free Instant Pot Mac and Cheese? Don’t forget to rate the recipe and comment below to let me know how it went. You can also FOLLOW ME on Facebook, Instagram and Pinterest to see what other fun things I’m getting up to. The ULTIMATE comfort food! Looks + sounds Delish!! 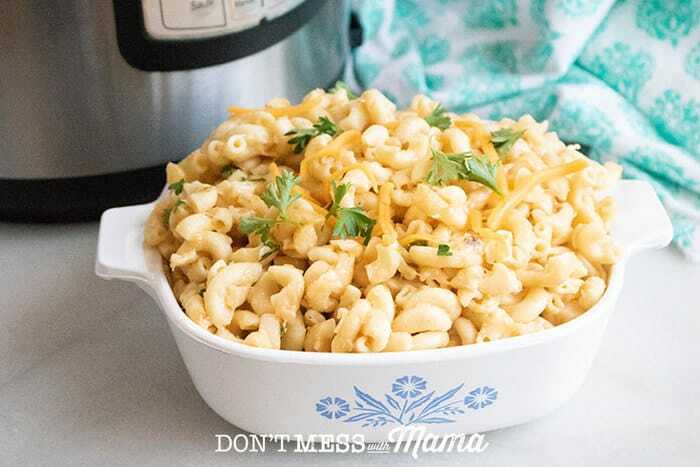 My husband loves mac and cheese and I prefer gluten free recipes so I will be making this! My husband would kill for this recipe. He loves mac and cheese. It looks delicious! I love the pepper jack in this IP recipe! So simple and my kids love it! Looks delicious and super kid-friendly. 😉 I love your little corningware dish, too. Haha! Such a yummy comfort food! That definitely looks legit! Thank you for the easy to follow instructions! my kids would go nutzo for this!! Got to try it for them!